Zesty Prawns cooked in spicy coconut sauce. Best serve with white rice. 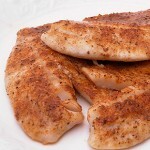 Sauted Salmon seasoned simply with garlic, salt, and pepper makes this nice fish entre very delicious. Fish cooked in a traditional style with a blend of aromatic and flavorful spices. This healthy & delicious recipe is a big hit in a party or gatherings. Delicious shrimp stuffed potatoes in which shrimp are simmered in garlic and other spices to flavor them, mixed in with baked mashed potatoes and stuffed in potato shells. Cubes of fish marinated, fried and served with flavors of peanut and sauce. A wonderful quick way to bake fish. This spicy seafood dish will delight everyone. 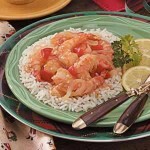 Prawns are marinated in a mixture of yogurt and spices cooked to make this delicious seafood dish.